You are here: Home / Blog / Soups & Stews / Happy St. Patrick’s Day! Bring on the Guinness! Happy St. Patrick’s Day! Bring on the Guinness! I’m Scotch-Irish (among other things), and I’m proud of this heritage. One thing I love about being Irish is that it gives me a great excuse to fully celebrate St. Patty’s Day properly. Although, I have to concede that few can enjoy and celebrate this holiday better than one of my best friends, Kara. 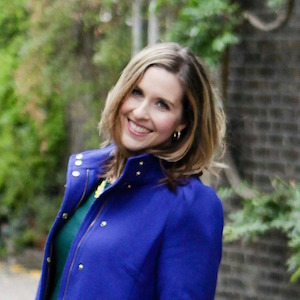 She is also Irish and inspires me to celebrate this holiday and that also translates to this blog. So I must start by saying that one thing that I think of whenever I remember Ireland is Guinness beer. I know most of you have probably just turned up your noses, but don’t worry, that used to be my reaction too. When studying abroad, a group of friends (including Kara) and I headed to Dublin for a weekend. We of course made our way to both the Jameson Distillery and the Guinness Brewery because we were college kids in Dublin, Ireland…it was a no-brainer! I must confess that I still don’t truly appreciate whiskey (Scotch, Irish, any kind) and maybe that will be something that changes as I get older. Guinness on the other hand was not immediately something I appreciated either. I remember when my Uncle Chuck found out that I would be heading to Ireland, he insisted that I drink a pint of Guinness for him. Well sure enough after the Guinness Brewery tour, we were each handed a pint of Guinness to enjoy in their sky bar at the top of the Brewery. It was all I could do to drink it, but I managed to get about halfway through the pint and quickly handed my friend my camera to immortalize this moment. I hoped the picture came out, because I didn’t plan to re-enact this scene ever again. Luckily, the picture did turn out and my uncle was over the moon when I presented it to him. (He proudly displayed the framed picture in the entryway of my aunt and uncle’s home for all of the world to see, which I thought was pretty awesome.) If I can hunt down a copy of this picture, I’ll add it here. 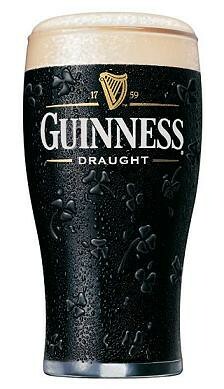 I ended up spending the following year getting my Master’s degree in England, and I found that my taste for Guinness had grown and I’m officially a fan now…yum! So when I saw Cooking Light tweet a stew that had Guinness in it, I was practically racing to the grocery store to get the ingredients. The stew was a Beef and Guinness Stew and I know you’re probably not convinced, but let me tell you to just go with it. 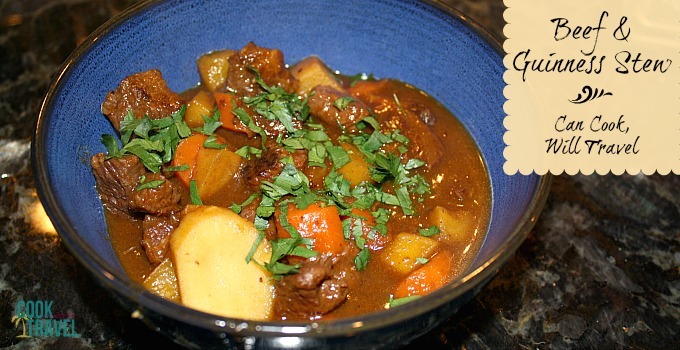 The beer adds a rich flavor to the stew, and the veggies send the dish over the top. Plus it’s a great way to sneak in your veggies…carrots, parsnips, and turnips help to warm you up from the inside out. This dish does take a while to cook, so do allow plenty of time for it to boil, simmer, boil some more and then simmer again. But it’s so worth it in the end to settle in with a glass of wine and this hearty soup on a chilly night…delicious! I love St. Patty’s Day…next up, Corned Beef and Cabbage!! What’s your favorite Irish dish? 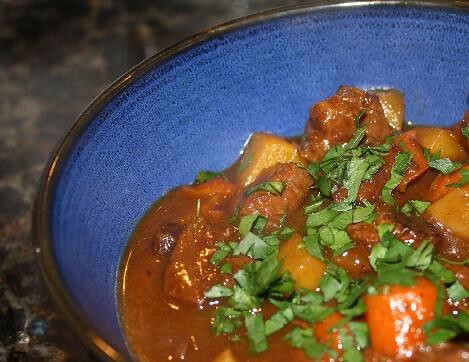 Click here to see the full recipe for the Beef and Guinness stew, step by step instructions and nutritional information.